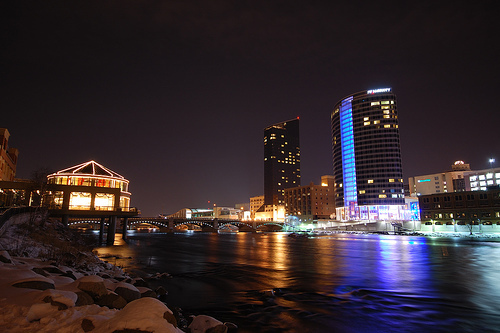 Grand Rapids is the center of a metropolitan statistical area that includes Kent, Ottawa, Muskegon, and Allegan counties. The Grand River, on which the city is located, shaped the future of Grand Rapids first as a leader in the logging industry, then as one of the world's primary furniture manufacturing centers, and now as the office furniture capital. The city's identity also was determined by thousands of Dutch immigrants who settled in Grand Rapids to work in the furniture factories. Today, the Grand Rapids metropolitan area has more than one million inhabitants, innovative cultural institutions, a revitalized downtown core, a diverse economy, and high marks for quality of life factors.